Darrell Burrage has served as Vice President of Finance for the H.N. and Frances C. Berger Foundation since 1996. In this capacity, Burrage oversees three areas of finance, including accounting, tax and security investments. With a broad background in accounting, investments and financial management positions, Burrage contributes his diversified and well-informed expertise. 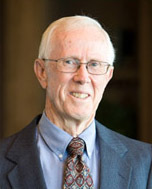 Burrage brings more than 40 years of financial experience to his work at the Berger Foundation. Before joining the Foundation, he was Vice President of Finance for several restaurant chains, and worked with the audit staff of what is now Pricewaterhouse Coopers, a national CPA firm. While managing two-pronged responsibilities for the H.N. and Frances C. Berger Foundation in the accounting and tax departments, he also guides the security investment portfolios and analyzes their performance measurement. Burrage is a graduate of the University of Southern California School of Business, with a major in accounting. In his spare time, he enjoys yard work and watching football, basketball and tennis.